The majority of the arms provided by the United States to the Kurdistan Worker’s Party (PKK) terrorist organization was provided by the Czech Republic, which released the Democratic Union Party (PYD) terrorist co-leader Saleh Muslum, despite Turkey’s extradition request. The BKS, Dochka, Draganof, Kalashnikov rifles, 23 millimeter ZU23, IGLA (SA-18) anti-plane weapons, mortar shells, Katyusha, and Grad weapons that were collected by Czech barons as part of the Warsaw Pact were distributed to U.S. bases in Bulgaria and Romania. From there, they were transported to terror group’s armories in Syria’s al-Hasakah. Colonel Haydar Ateş, the former commander of the Afghanistan Turkish Task Force, spoke exclusively to Yeni Şafak and evaluated recent developments. Until 1990, the illicit weapons procurement center was East Germany, but after the reunification of East and West Germany, these activities were carried out through Czechoslovakia. Noting that the Prague-based arms trade reached $70-80 billion a year, Ateş emphasized that the biggest customer of the weapons stock market in Prague over the last five years was the U.S. The Turkish community living in the United States voiced their reactions against the U.S. support to the PKK terrorist group’s Syrian affiliate PYD in a press conference in front of the Capitol in Washington on Wednesday.Representatives of the U.S. branch of the Independent Industrialists' and Businessmen's Association (MUSIAD), the Cihannuma Solidarity and Cooperation Platform Association and the Turkish-American National Steering Committee (TASC) were present at the press conference protesting the U.S. Congress for using taxpayer money to support the terrorist group.Murat Guzel, the organizer of the event, emphasized the importance of increasing American-Turks’ role and influence in U.S. politics and stressed that the Turkish community should ask the U.S. authority to account for their taxes.Russia says US has established about 20 military bases in SyriaPointing out that the U.S. administration was aiming to allocate over $500 million to the PYD/PKK of the 2019 budget, Guzel said, "This money is being cut off from our taxes. Ironically, the U.S. intelligence organizations also described this group [PYD] as an extension of the PKK terrorist organization. As a matter of fact, in the past weeks, they have submitted a report [on this] to the Congress. We, as taxpayers in America, have met the members of the Congress and called them to account for the taxes we have paid and we will continue to do it. "We have received very positive results especially from talks we have done yesterday and today, and we will increase our visits to the Democratic Party," said Guzel.He also called on the Turkish community in the U.S. to call their representatives by phone and email or to visit them to contest the use of their taxes.Better relationsMUSIAD's U.S. President Mustafa Tuncer said they had told the U.S. congressmen that “terrorism cannot be supported by the taxes we have paid".He highlighted that the contribution of Turkish investors to the U.S. economy could not be underestimated.Cihannuma U.S. President Levent Ali Yildiz emphasized that Turkish-American relations were going through a critical period.He argued that the damage in Turkish-U.S. relations was not only by the PYD/PKK terror group but also U.S. ties with the Fetullah Terrorist Organization (FETÖ), as its leader resides on U.S. soil.“Our negotiations [with the lawmakers] were very productive," he added.FETÖ and its U.S.-based leader Fetullah Gülen orchestrated the defeated coup of July 15, 2016, which martyred 250 people and injured nearly 2,200 others.Ankara accuses FETÖ of being behind a long-running campaign to overthrow the state through the infiltration of Turkish institutions, particularly the military, police and judiciary.TASC co-Chair Halil Mutlu added that Turkish-U.S. relations were better than what recent media reports were portraying.He said the Turkish community in the U.S. would continue to make its voice heard and would contribute to restoring relations between the two NATO allies. "We saw that the connections were not as damaged as they were written and drawn [in recent reports],” he added. "The Pentagon and the CIA are very well aware of who they are giving their weapons to and are afraid of giving weapons in their own inventory to the PKK in case that they are held to account in the future," said Ateş. “Everyone takes their share of the illicit activity. Except for the Javelin and TOW-type anti-tank weapons, the remainder of the weapons sent by the U.S. to Syria are Russian-made. The UAE foots the bill for the weapons buildup. The political and military authorities who served on the field in the illegal arms trade also received personal profits from these businesses,” he added. 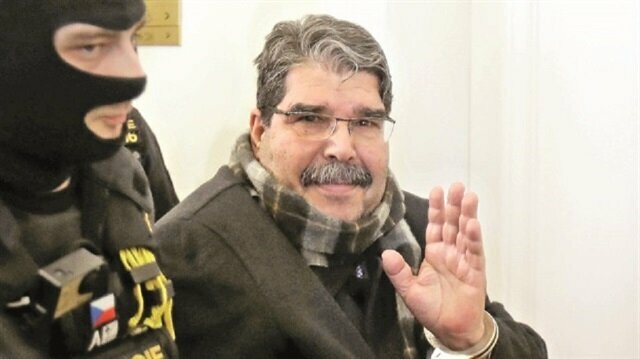 A Czech court on Tuesday released Salih Muslum, former co-leader of PYD/PKK terrorist group, despite Turkey's requests for extradition. Muslum was smirking as he left the court. A Czech court on Tuesday released Saleh Muslum, former co-leader of the PYD/PKK terrorist group. Muslum was detained on Sunday in Prague after Turkey called on the Czech Republic for the arrest of the former terrorist co-leader. The Turkish Interior Ministry had offered a bounty of nearly $1 million on Muslum who is listed as a most wanted terrorist. Muslum allegedly met with arms dealers in Prague following his release. Yeni Şafak has obtained information stating that many top PKK officials including Zubeyir Aydar and Sabri Ok made similar visits to the country between 2014 and 2017. There are reportedly over 40 Czech citizens in the "International Battalion" formed by foreign fighters of the PKK in the Sinjar and Qandil camps. Two Czech citizens named Marketa Vselichova and Miroslav Farkas, who were trying to cross into Iraq to join the PKK ranks, were arrested in Turkey’s Şırnak in 2016. The U.S has supplied the PYD terror organization with more than 5,000 truckloads of weapons to allegedly use in the fight against Daesh, despite Ankara’s warnings that the group is the Syrian offshoot of the PKK terror organization.